I confess; when it comes to marketing and promoting your blog on social media, nothing beats Facebook. Twitter, however, comes close. With more than 1.3 billion user accounts, Twitter is a goldmine of potential for your blog posts. Whether you want to gain more views for your blog post, or want more social shares in Twitter, there are methods you can adopt to achieve your goals. In this guide, I am going to tell you several means and ways to make the most of Twitter to popularize your blog posts. To win on Twitter, KISS (keep it short, silly). Agreed, anyways you only get 140 characters in a tweet (which is short enough). However, research has shown that tweets shorter than 100 characters get up to 21% more interaction as compared to those that use the full allocation of 140 characters. You don’t just have to write your blog post’s title as a tweet; it’s time to be creative, Generate interest, inspire disbelief, make outrageous claims (only rarely, though), to motivate readers to click on the link of your blog post. Here’s a list of tools you can use to shorten the URL of your blog post. I like TinyURL the most; it’s so simple, you can get the work done within 10 seconds. I wrote a catchy (well, I think so) tweet for my blog post titled “How to use Live Video to Build Your Personal Brand”. The tweet is – Why Superstar Bloggers Need to GO LIVE. I converted the blog post URL into a tiny URL. This is a miserly 67 characters, and you thought 140 was too little! Wishpond has compiled a brilliant list of ways to make your tweets more attention-worthy. Check it out here. Research suggests that tweets with stats get more attention than ones without them. Using numbers and characters in your tweet makes it stand out among the dozens of competing tweets that will be present in any Twitter user’s timeline. Here’s a perfect example of how it’s done. Hubspot used a stat, created a question around it, and created an intriguing tweet that generated immense interest. For those of you who’re just getting started with Twitter, hashtag refers to a word (or words) followed by a # symbol. Hashtags have been in use for many years now, and serve the awesome purpose of connecting with a whole lot of Twitter users, and not just those who Follow you. Hashtags are now so popular that you see them on almost all social platforms. Here are 2 approaches of using hashtags on Twitter. 2 – Create a more generic set of hashtags pertaining to the niche of your blog. These hashtags would be useful inclusions in all your routine tweets. Also, this makes your tweets (and hence the promoted URLs) relevant for Twitter users who search for content using specific search words. To know more about the latest trending hashtags, this is your resource. It also makes you wary of hashtags with declining interest levels. The best part – you can browse through lists of trending hashtags based on categories. It offers pretty decent tools even in the free version. I did a search on “SEO” and was shown this popularity chart. Nothing complicated here; it’s the official search page of Twitter. If you’ve thought of a few hashtags, I advise you to do a quick search on the same, and see the number of results you get. This helps you get a hang of the popularity of the hashtag, and also helps you understand the context in which the hashtag is being used. I understand you only have limited time, and can’t tweet too often. Why not create a schedule of your tweets? There are many free and inexpensive tweet automation tools out there with advanced features that make your tweeting job as easy as 1-2-3. Buffer is a marvelous app to schedule tweets. All you need is to sign in using your Twitter account, and click on the Schedule option. Set the time zone same as that in your Twitter account. Set a posting schedule up, based on analysis of when your followers re most active. Look to experiment with different posting frequencies and schedules to find out what works best for you. You can try out the Optimal Timing Tool to let Buffer automatically decide on the best times to post your tweets. Here’s a detailed post to help you use Buffer for tweet scheduling. Any meaningful conversations you engage in with fellow Twitter users and professionals from your field will help you get more followers, get some great ideas, and also, get some more visits for your blog and specific blog posts. Twitter chats are among the lesser used but highly relevant platforms to achieve this. A Twitter chat begins by using an agreed hashtag. For instance, check out this chat using hashtag #semrushchat. Now, as you see the chat steering towards a point of discussion on which you have a blog post already written, it’s time smartly put in your message along with a link. This can create an immediate influx of traffic to your blog. Then, because all Twitter chats are in the public domain and searchable, this automatically means that any searches based on the chat hashtag will bring your message up, increasing potential of more traffic later on. 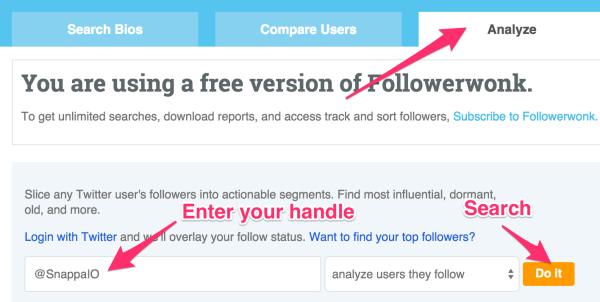 Use Moz’s FollowerWonk tool to find out the ideal times when your followers are most active. 2. Use TweetReports to avoid clashes with more popular and competing chats. 3. Invite leaders and influencers to your chat. I use FollowerWonk to identify the best people to invite. Use the Search Bios option in the tool, add a relevant keyword in the search box, and select Search Twitter Profiles. You can use further filtering criteria like minimum followers, location etc, to hone in on the best influencers. Click on Do It when ready. I’ve covered 5 methods that can help you get more traffic to your blog using Twitter, apart from getting you more followers. Like I always say, experimentation and continuous effort are the two pillars on which social media success rests. So follow these tips, let me know your experiences, and keep on enjoying your blogging.